Here’s something about the Social Media nowadays, they’re all useless now. Apart from sharing those puppies faced snap stories, what good are these networks anymore. Also, you can satisfy your whim for all the information you need on different of blogs, portals and websites that dish up this information for you. But what if you could go to a single website and browse through updates regarding topics, per your personal interests? Affimity is a new social network which aims for that experience. It is a platform for people with similar interest to meet and engage with, based on their passion. Affimity is a new social networking platform that aims for connecting people with similar taste. Affimity is designed using OpenStack, and its servers are hosted on Amazon Web Services (AWS). It also provides its users for creating any number of channels. Users can follow one or more channels, according to their interests. Users can post their thoughts, ask questions, make friends or follow people. Unlike other social networks, Affimity gives an opportunity to users to discover people with similar interests. Finding the people with same interest or passion as you are always a difficult job. Luckily, Affimity allows its user to find people with similar interests. Unlike other social networks, you don’t have to know the person, in real life, to have a conversation. Affimity intends to be the platform of choice for anyone looking to share his interests with others and find people with similar interests. They are working to provide better content and community experience as they are reaching out to more and more people. They are continuously working on adding more channels as well as customizing the present one to suit the requirement of that community. Affimity is also widely used as a social blogging platform. They have over a thousand bloggers with varying interests. Affimity is providing them with a great platform to reach out the people with similar passion. Affimity is started by Venkata Ramana, Amar J Singh and Parveen Mittal. Ramana Venkata, the co-founder of Affimity, faced this interesting difficulty. As a father of twin kids, he was looking for a community that could understand his situation. Facebook Groups, to some extent, does the work for him, but the overall experience was not satisfactory. Ramana realized that there isn’t any real platform available out there; that helps people to discover other people’s sharing common interests. Be it parenting, sports, technology or anything else. Ramana believed that this gap could be filled by simply attending to user interests first. Affimity is the result of that idea. Affimity has more than 25 employees in India and US. Also, Affimity has a large number of engineering and content freelancers. Affimity is social network designed for connecting with people who share your passions. It’s simpler to use. Affimity on the concept of channels, the team has created many channels to let user’s post in like food, beauty, sports, fitness, etc. Users can create any number of channels. Users can follow one or more channels, according to their interests. Users can post their thoughts, ask questions, make friends or follow people. Like you have posted something in the tech channel, then the peoples who have subscribed to the tech channel can see your post in their feed. From there, people can follow you or can have a conversation with you. 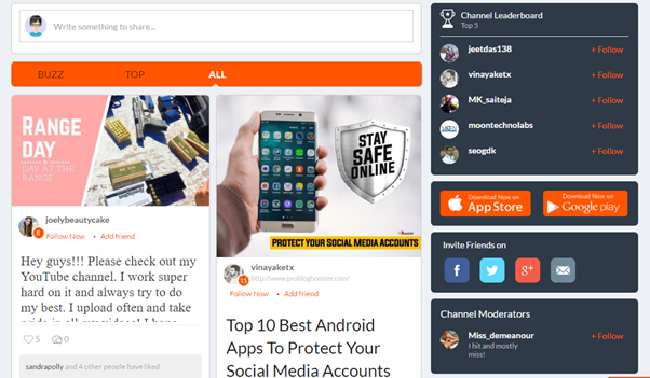 Streamlined Social Network into different channels. Users can create channels and follow other users. 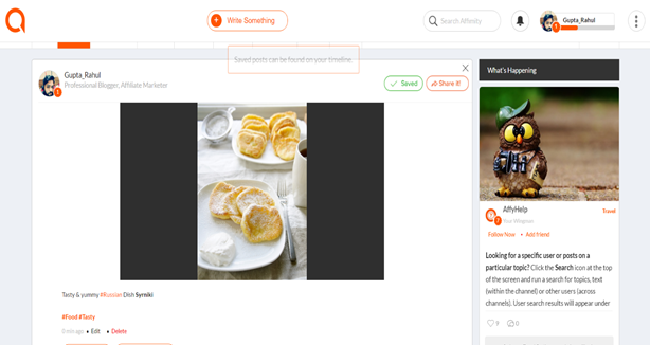 Inspired from multiple ideations, this social network is a beautiful blend of all the good features. Affimity gives people’s reach to a whole lot of people with similar interests. Affimity offers an all-in-one solution for the people’s looking for a right community. They have created lots of different channels so that people can reach the right audience. Also, their team is trying to add more channels on the platform to categorize interests to make it more productive for users. There are a lot of women-centric channels like Cooking, Beauty, Fashion, Parenting, etc. It was easy to post something on the channel. Since, all the posts can be publicly viewed in the respected channel categories, therefore it is quite a good way to connect to new people. The User Interface of Affimity is simple and easy to use. Affimity also have an Android app and iOS app to make the work even easier. You can have a look at my profile here. I shared one post which looks pretty good. The overall experience using Affimity was great. I have made a few new friends on Affimity as well, using the Tech channel. So, this was Affimity and my thoughts on why this is a good place to spend your time nowadays. It’s a great way to streamline social networks into channels so that people can find other people with similar interests or passion. In my opinion, this social network is something different and unique and has a lot of potentials. Do share your thoughts about this new social media and let me know if you’ve already signed up on Affimity in the comment section below.